Our mental maps of the places we've been aren't marked with the names of provinces or states, cities or towns, streets or alleys. Our coordinates are local specialties, and our landmarks are the stalls and shops that dish them up. 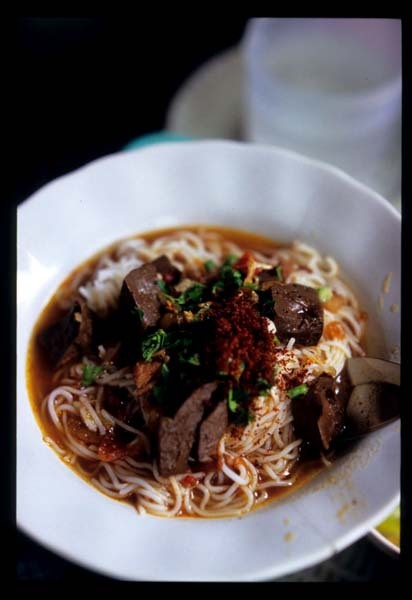 When we lived in my quang-ville we always welcomed an excuse to visit bun cha. Our first trip to Sumatra was all about nasi Padang, and our last introduced us to babi panggang. From the Philippines we fondly remember our Holy Weekend at halo-halo, about an hour and a half's drive from sinigang. On our last trip to Turkey (too long ago) we drove cross-country, starting at fresh purslane drenched in garlicky yogurt, continuing on to semolina flour halva and then further to bastirma and the country's finest manti, finally arriving at lahana corbasi and Laz boregi. And Kuala Lumpur? Well, most trips to the grocery store take me by Sarawak laksa, just ten minutes from north Indian chaat. In northern Thailand our plane landed at kanom jeen nam ngiaw, and then we road-tripped from kanom jeen nam ngiaw to kanom jeen nam ngiaw, stopping for kanom jeen nam ngiaw along the way. The northern provinces are one big kanom jeen nam ngiaw sinkhole. Khao soi attracts all the attention; with its combination of crunchy and soft noodles and a gentle coconut milk come-on followed by restrained chile hit, it's easy to love. 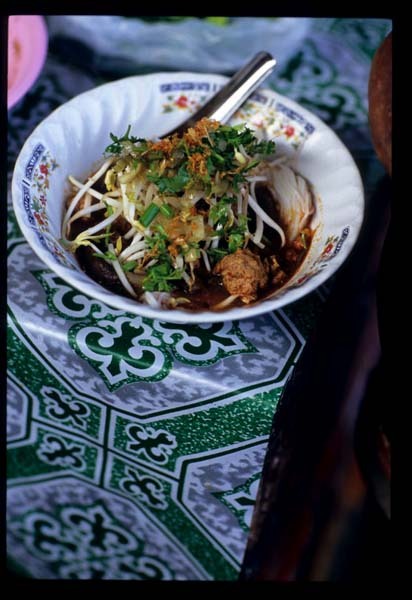 But observation tells us that kanom jeen nam ngiaw is the region's true noodle superstar. That's just fine with us, because we can't get enough of the stuff. 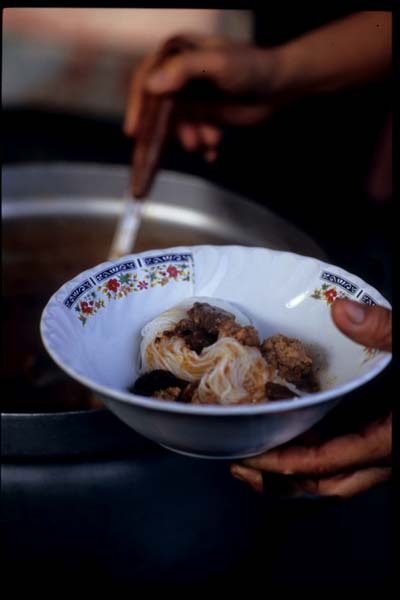 Kanom jeen are vermicelli-like noodles made from a batter of fermented rice. They're found all over Thailand, topped tasty curries toppings (and, in Isaan, served side-by-side with green papaya salad) like gaeng kiaow waan ('sweet' green coconut milk curry) and gaeng tai bplaa (pungent and fiery fish innard curry) and served with an endless variety of herb and vegetable sides. In the north deep-fried pork rinds, sold in small bags, are part of the sides-show. Local crush them in the bag and then sprinkle the pieces over their noodles. 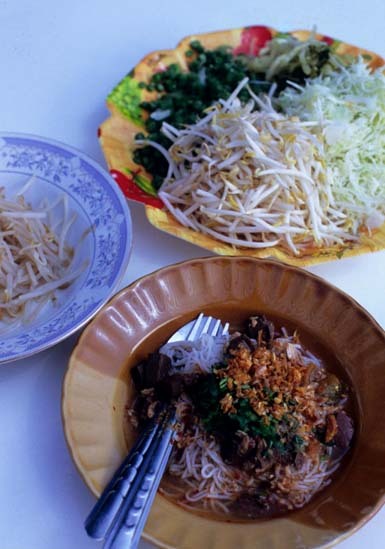 Nam ngiaw is said to be a Shan dish and is most often associated with Chiang Rai. It is a coconut milk-free curry made with dried chilies, tomatoes, and beef (if the cook is a northern Thai Muslim) or pork and blood cakes. It's thin and soupy and varies from surprisingly light, slightly sour, and tomatoe-y (almost ragu Bolognese-like) to salty, pungent with gapi (shrimp paste) and searingly hot. Every cook has his or her own twist on the dish - which is, I suppose, why we find it so easy to eat kanom jeen nam ngiaw day after day, and sometimes even meal after meal. Hidden down a tiny soi across from Chiang Mai's Mahawan Temple, a blink-and-you'll-miss-it storefront seats eight at just two tables. 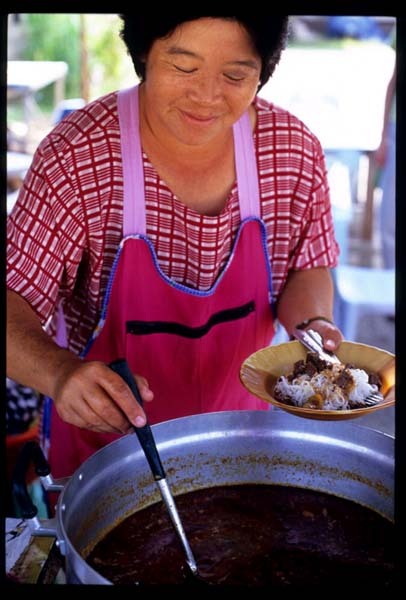 The shop's owner (above) has been making and selling her kanom jeen nam ngiaw (and kanom jeen nam yaa - noodles topped with a mild fish curry) here for over ten years; she opens mid-morning and closes by late afternoon. 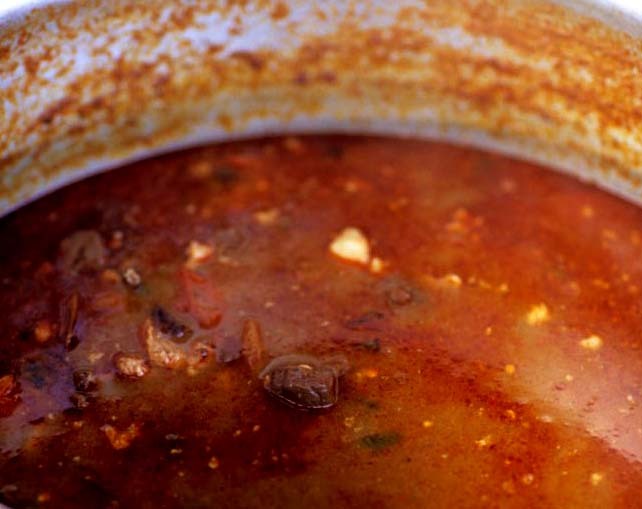 Her version is hearty: meaty, a wee bit fish-flavored, and full-on spicy. Unlike most vendors, who garnish their kanom jeen with a flurry of crisped garlic, she sprinkles on a spoonful of powdered toasted chilies (opening photo) along with bits of basil leaf. 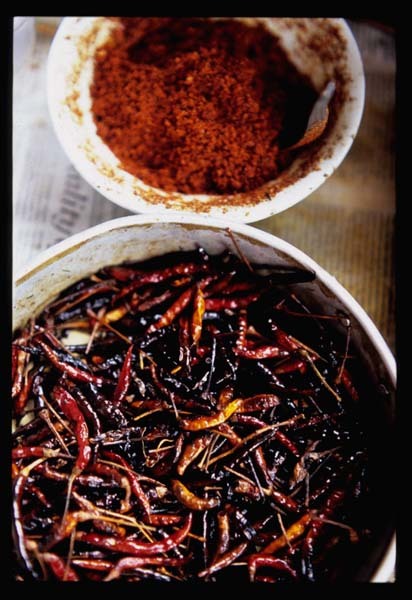 Diners who desire more fire can add prik tawt (crisp-fried dried chilies, above) to taste. We find her blood cakes to be exemplary, with a good bit of resistance (we don't favor soft and wobbly, gelatinous cakes) and a lovely smoky flavor that seems to have leached into the curry. A week - and many bowls of kanom jeen nam ngiaw - later we find ourselves in Fang, a town about an hour from the Myanmar border. It's a quiet Sunday morning and we're wandering the streets, admiring Fang's old wooden houses and looking for - what else? - something worthwhile to fill our bellies. 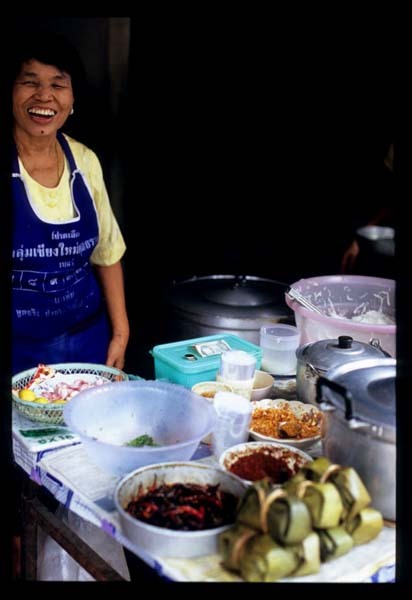 A woman operating a kanom jeen stall in front of her house obliges us, dipping up her own version of nam ngiaw from an enormous vat and serving it with a generous spread of blanched and fresh bean sprouts, shredded napa cabbage, blanched and chopped snake beans, chopped cilantro and basil, and slivered pickled mustard (a must with kanom jeen). Hers is a lighter (both literally and figuratively) version than that served on the Chiang Mai soi, the curry more orange than red, the chile heat subdued, and the flavor of tomatoes almost more prominent than that of meat. No powdered chile topping here (plenty of fried garlic, though), although she does offer us a serving spoon full of prik tawt, suggesting that we eat the crispy chilies on their own, between bites of kanom jeen, rather than mixing them in. On our way back to kanom jeen nam ngiaw (oops, Chiang Mai) from kanom jeen nam ngiaw (er, Fang), we stop somewhere between Chiang Dao and Mae Rim to stretch our legs and, perhaps, to sit down to a meal of, um kanom jeen nam ngiaw. The stall is decidedly rickety and situated on an unpleasantly busy and exhaust-smoked street and the couple manning it not overly friendly. But we're curious about a vegetable offered alongside the kanom jeen. 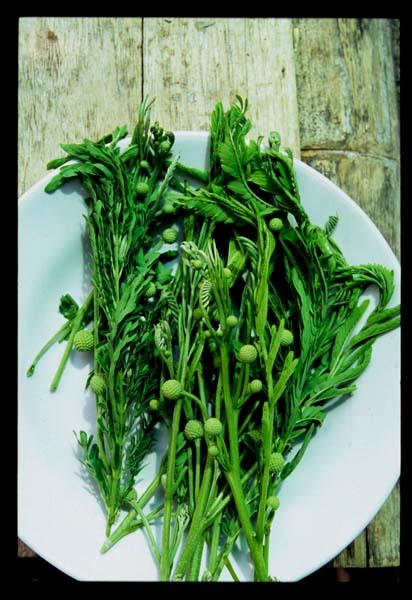 Its leaves resemble those of cha-om, a not entirely pleasantly-scented, but nonetheless delicious, green vegetable that, in addition to often being served alongside kanom jeen, is cooked into omelets and thrown into gaeng som (sour curry). Sure enough, the gatin makes a fine addition to the couple's exceptionally meat nam ngiaw, studded with big chunks of greenish tomato and spongy blood cakes. This is the least spicy version we've sampled; the emphasis here seems to be on fresh turmeric and garlic. It's satisfying in its own way (and the gatin is wonderful, sweet and crispy and slightly broccoli stem-like), but we miss the chile hit. Days later we find our kanom jeen nam ngiaw Holy Grail in a morning market in Lampang. We're drawn to a stall at the back of the market by the gorgeous smells wafting from a huge, bulbous clay pot. It's gaeng om, the vendor tells us, and then instructs us to sit down for a taste. Gaeng om is made with beef or buffalo - that's the most we're able to get out of this otherwise friendly woman who hails from Chiang Rai regarding her specialty. The curry is knock-me-down heady with galangal and lime leaves and, like a good French daube, thick with bits of long-simmered protein; it's easily one of the most memorable dishes of our trip. When she lifts the lid off a pot of nam ngiaw and asks if we'd like a taste. We don't hesitate. As fantastic as this woman's gaeng om is, her kanom jeen is better. It hits all the right notes - bold and fatty-rich porkiness tempered by sour from tomatoes, enough heat to zap the tongue in passing but not enough to overwhelm the taste buds. There are dried spices mingling in this curry that we can't even hope to guess at. Rather than serving accompaniments on the side she piles everything right on top, with the assurance of a woman who' s been eating kanom jeen nam ngiaw all her life and so knows just how much pickled mustard and bean sprouts are required to bring the dish into perfect harmony. After two bowlfuls we're sorry to admit that we don't have room for more. We're even sorrier that we live a good bit of air time away. We can't wait to go back to kanom jeen nam ngiaw. Lampang, I mean. In Chiang Mai: Chang Mai Road, Soi 2 (across from Mahawan Temple). In Fang: Tessaban Road, 2 streets behind Wat Chedi Ngam and 3 blocks from the river. Mornings and afternoons. On the road between Chiang Dao and Mae Rim: we're sorry, but we have no idea where this place is. We're not even sure we could find it again. In Lampang: Wisonin morning market, in the roofed section in the back of the market (away from the main street). So many different versions of one dish and they all look so wonderful. It must've been hard to finally decide on your favorite! Ideally naam ngiao should be made with thua nao, compressed disks of soybean, not shrimp paste--this is part of what makes it a Shan dish. 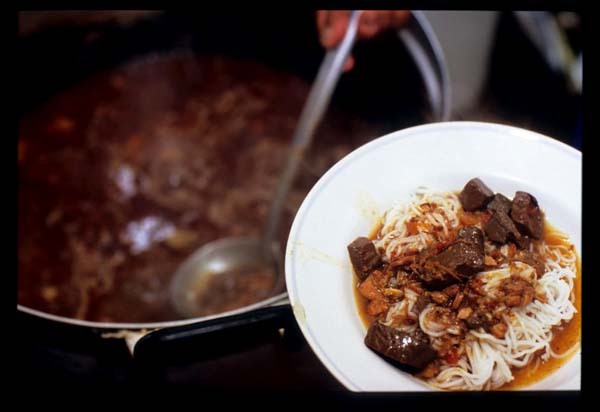 The shan version also just uses a tiny bit of ground pork, whereas the Thai version uses pork spareribs and blood, and is thicker. Did you try the banana-leaf wrapped packages shown at the bottom of the second pic? They're another Shan dish, khao kan jin, rice mixed with blood and steamed and served garlic oil. Delicious. In real Shan places (like Mae Hong Son), they're served with the root of a particular leek-like veggie. Kathin is usually eaten with raw oysters and naam phrik phao around here! Re. the omelet in kaeng som you mention, I think that's actually cha om, not kathin. Kathin is not normally cooked. Austin - thanks. I'm not sure that tua nao is a uniquely Shan ingredient (was it introduced to northern Thailand from Burma?). It's used widely in northern Thai dishes by non-Shan cooks (though it might be argued, of course, that Shan influence has crept into many if not most northern Thai dishes). Also used in the north, by the way, is an unpressed, 'beany' version of tua nao. 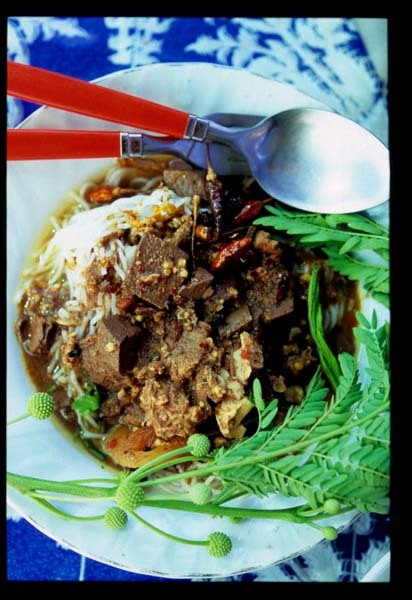 (For anyone without access to this interesting ingredient, David Thompson gives a recipe in his 'Thai Food'). It's served as a dish in its own right. Interestingly, one of your favorite Thai food writers, Suthon Sukphisit, in an article on Karen food, describes tua nao as a 'fermented peanut product'. Perhaps Karen tua nao and Shan tua nao are two different things entirely. Kathin - by 'around here' do you mean Bangkok? This is really interesting; I imagine that its vegetal sweetness would probably complement an oyster's brininess quite well. The link you provide to appears to show exactly the dish I described, and not naem as you mention, although it's hard to tell by the pic. Khao kan jin is often served in that pyramid shape. Yep, in BKK and any coastal area where one can get oysters. I'm not sure what vegetal means, but it's very young, tender kathin that is used, which has a more subtle flavour than the mature, more pungent kathin. OK, rereading it, I see what you mean now. Kathin and cha om are actually very similar in flavour, but used in different ways.